Truly one of a kind Hilltop home! 4312 sqft of living space, and stunning views out of every window! 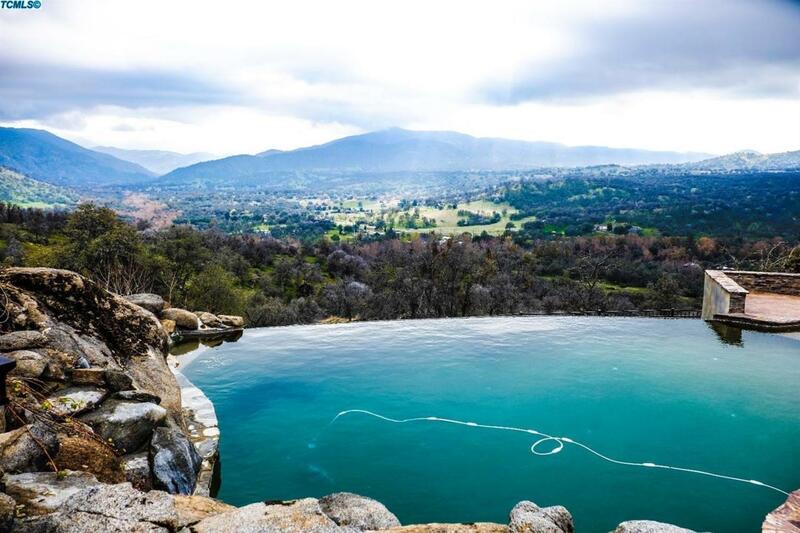 Nestled just out of Sequoia National Park, this hilltop home is truly one-of-a-kind. 3 levels with 4 Bedrooms, 4 Baths, the family room has radiant heat under the tile flooring, a huge fireplace and french doors to the patio beyond. The kitchen has quartz counters, a nice big island, trash compactor and a double oven. The master bedroom opens to a balcony with beautiful view to start of your mornings. The pool is set into a multi-level stamped concrete patio, with a brick fireplace and an infinity edge. There is even a TV in the outdoor seating area that stays with the property. The entire 48.36 acres is fenced and has a pond. Just below the main house, there is a gorgeous 1 Bedroom, 1 Bath 700+ sq. ft. guest house with a 4 car attached garage! The 80, completely paid for Solar Panels makes for no electric bill, and usually an SCE reimbursement. Contact me today for your personal tour. Listing provided courtesy of Chad Miller of Stratton Davis Realty.